Lawyer Elchin Sadigov’s request for a meeting with Muslim Union Movement director Taleh Bagirzade, who is held in Baku Detention Facility, has been turned down, Sadigov told the Institute for Reporters’ Freedom and Safety (IRFS). Taleh Bagirzade was arrested in an operation conducted by law enforcement officers in Nardaran settlement of Baku on November 26, 2015. According to the Prosecutor General’s Office, 58 people were arrested in connection with the Nardaran events. The Serious Crimes Investigation Department under the Prosecutor General’s Office launched a criminal case on the fact and those detained were charged under Articles 120 (deliberate homicide), 214 (terrorism), 220 (mass disorders), 228 (illegal acquisition, transfer, sale, storage, transportation or carrying of firearms, their accessories, ammunition and explosives), 233 (organization of actions promoting infringement of public order or active participation in such actions), 278 (violent seizure or maintenance of power), 283 (inciting national, racial, social or religious enmity) and 315 (resistance or violence against a representative of authority) of the Criminal Code. According to Elchin Sadigov, as the reasons for refusal they cited the fact that the prosecutor’s office had not sent them a letter for his meeting with his client. “I have been introduced to Taleh Bagirzade by the investigating authority and have met with him several times. The law does not require a letter of consent by the prosecutor’s office for a defense counsel’s meeting with his client,” the lawyer said. The lawyer added that the fact that Baku Detention Facility requires such a letter and does not allow a defense counsel to meet with his client due to the lack of the letter is completely illegal and grossly violates Taleh Bagirzade’s right of defense. 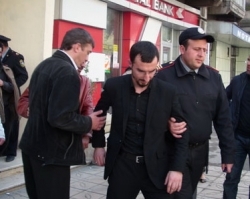 According to the Criminal Procedure Code and the Law of Azerbaijan Republic on Ensuring the Rights and Liberties of the Persons Held in Places of Detention, the arrested person has a right to meet with his lawyer. Prevention of such meetings amounts to depriving the person of his right of defense, which is prohibited by both the Constitution of the country and the European Convention for the Protection of Human Rights and Fundamental Freedoms.